Updated 3/22/2018 Akt 03: "A Princess's Oath ~ Dornröschen: Panorama." Sensing that the creepy restaurant owner Ebine is host to one of the heart shards she is seeking, Princess Tutu appears and offers to dance with her. The setting changes to a misty wilderness draped with thorn-encrusted vines [Dornröschen in German]. 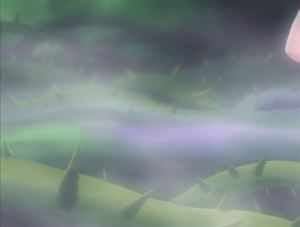 The misty briar-rose vines painted on the top half of this background are shown only briefly and in soft focus, as in the screen cap above. Tutu's ballet slippers step into the scene in extreme close focus, just in front of the added book layer at the bottom of the frame. The name of the restaurant owner is "Ebine," which is the word for an orchid native to Japan, and also is used there as a first name for girls. But épine is French for "thorn," which explains why she encounters Tutu in a briar swamp.